Are you comfort conscious? These 100% Bamboo viscose 600 Thread Count Sheet Set is an impeccable choice. 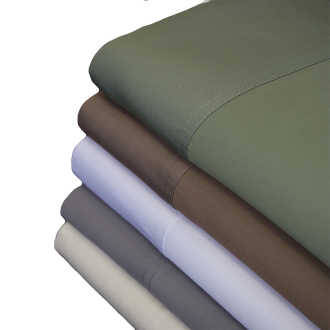 These 100% bamboo viscose sheets are acknowledged for their natural softness, durability, and breathability. These sheets are cool and welcoming every night of the week. Experience our superior bamboo viscose sheets for yourself, and see what we mean. They come in 5 soft and soothing colors and make every bed in your home a bamboo viscose one. Our bamboo viscose bed sheets are made from silky-soft bamboo fabric that’s twice as soft as cotton, offering you the most comfortable sheets on this planet. It's machine-washable and odor-resilient, making it perfect for all the beds in your home and any bedroom set. Each set includes 1 flat sheet, 1 fitted sheet, and 2 pillowcases. Fitting your mattress up to 18" deep. Assembled from bamboo viscose, this 100% bamboo viscose sheet set will offer your bedding a lavish touch with its sateen weave and 600 thread count. These thick well-appointed sheets feature a soft sateen manufacture in an unbelievably luxurious 600 thread count. Several vivid color options are available for this premium sheet set. This bamboo viscose sheet set comes with a flat sheet, two pillowcases, and a fitted sheet that will add a luxurious feel to your bed. The fitted sheet features a generous 18-inch pocket depth that can easily lock over any thick mattress. These sheets are guaranteed to satisfy. This bamboo viscose sheet set is manufactured out of bamboo viscose. Our use of bamboo viscose in our sheets makes these bed sheet sets outstandingly soft and breathable. These bamboo viscose bed sheets are fully elastic and have deep pockets, which means that they may be slipped easily even when wrapped over thick mattresses. These bamboo sheets are moisture-wicking which means they rapidly absorb sweat. These bamboo bed sheets are anti-bacterial. They are not affected by washings, even if washed several times. They wear long because they are mold-resistant and fade-resistant.